WASHINGTON, DC, January 10, 2015 (ENS) – A new type of solar pavement that can generate electricity and send it to the power grid is being developed by the U.S. company Solar Roadways, with funding from the federal government say Michael Trentacoste and Robert Johns of the U.S. Department of Transportation. Trentacoste is associate administrator of the Federal Highway Administration’s Office of Research, Development, and Technology. Johns is director of Volpe, the National Transportation Systems Center. Solar Roadways, Inc., based in Sandpoint, Idaho, created the new pavement in response to a 2009 solicitation from the Federal Highway Administration that asked companies to develop a new pavement that could generate power and transfer it to the grid. To receive initial funding from the DOT, the pavement had to use recycled material, withstand traffic loads, and be durable enough to avoid costly replacement cycles. In response to this solicitation, Solar Roadways began proof-of-concept work on self-sustaining pavement, made from hexagon-shaped solar panels. If successful, this pavement could eliminate the current practice of replacing asphalt, and ultimately transform the nation’s roadways into an intelligent pavement system, say Trentacoste and Johns. The Solar Roadway panels feature LED lights that can paint the road lines with light from beneath the pavement, lighting up the road for safer night time driving. Since Solar Roadways’ proof-of-concept results were promising, the Federal Highway Administration awarded a Phase II contract in 2011 to develop and test a prototype for a pavement made of solar panels. After testing multiple glass samples in various shapes for traction, load, impact resistance, and transmissivity, Solar Roadways discovered that the optimal solar panel could be made from low-iron glass with a transparent surface. The resulting system surpasses the limitations of today’s asphalt pavement by providing four-color LED lighting and heating features that melt snow from the road. “Everyone was encouraged by the results of the initial prototype pavement testing, and we recently awarded Solar Roadways a follow-on Phase IIB contract to continue developing and testing this exciting innovation,” write Trentacoste and Johns on the DOT website. 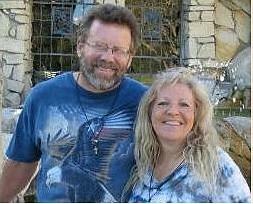 The co-inventors and co-founders of Solar Roadway, Julie and Scott Brusaw, say their pavement has special benefits for drivers of electric vehicles. Scott is an electrical engineer with over 20 years of industry experience. Julie is a counseling psychologist. They met as small children. Scott says he envisioned “electric roads” in early childhood. He has one drawing left from that time – a version of an electric road before most people had ever even heard of solar power. 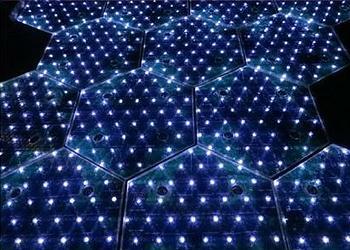 One of the problems Solar Roadways must still resolve is the manufacturing process for the composite solar panels. Today each of the solar cells is manufactured by hand, and they are very costly to produce. With embedded heating elements, the solar pavement can melt snow on the road or keep water from freezing, so Trentacoste and Johns suggest that even if the cost for comprehensive highway implementations is too high, the innovation could still be useful in smaller areas such as parking lots, sidewalks, driveways, and bike lanes. In addition to DOT funding, Solar Roadways has also raised US$2.2 million through its own crowdfunding efforts. They used the funding contributed by the public to hire employees for the company while DOT funds are used to conduct further testing, make product and process refinements.